Emirates Airlines have listed Avondale Cyclus for Business Class flights. 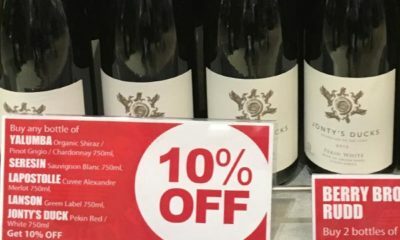 Avondale Jonty’s Ducks Pekin Red and White wine launched at Dubai Duty Free shops in October as part of a promotion on Organic wines. Diverse Flavours is pleased to announce that from March 1st 2014, ANA (All Nippon Airways) will be pouring two Avondale wines in First Class. Avondale receive a great honour from ANA President and CEO, Mr Shinobe. We were very fortunate that the President & CEO of ALL NIPPON AIRWAYS (ANA), Osamu Shinobe, Director Yamamuro, Deputy Director Takeshita and Senior Manager Nomura visited Cape Town for an Airline Conference in early June. Diverse Flavours is pleased to announce that All Nippon Airways (ANA) will soon be pouring Avondale Anima Chenin Blanc 2010 in First Class. TMF International have recently launched wines from Avondale (La Luna, Samsara, Anima, Cyclus); Hidden Valley (Secret and Gems), and Napier (Red Medalion) in their shop in Makuhari, Chiba. Diverse Flavours is pleased to announce that Korean Air have listed the Avondale Samsara 2006 as part of its In-flight duty free sales program in the Skyshop.